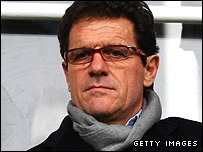 New England manager Fabio Capello has been named the new president of the League Managers' Association (LMA), as is customary for the national coach. "I'm aware of the importance of the LMA and the work it does. It's an honour to accept the invitation," said Capello. LMA chairman Howard Wilkinson added: "Since the LMA's inception in 1992, the England boss has always been president. "We now look forward to Fabio building a strong relationship with the game and other managers in England." And Wilkinson paid tribute to Capello's predecessor Steve McClaren, saying: "We would like to thank Steve for his efforts, energy and support of the LMA in all that we do." The LMA had called for an English manager to succeed McClaren prior to Capello taking the job, while vice-chairman Frank Clark has since described the Italian's appointment as a "big disappointment". However, LMA chief executive Richard Bevan welcomed Capello's acceptance of the presidency, saying: "Fabio brings extensive experience of football at the highest level from across Europe. "On behalf of the LMA members we welcome Fabio and wish him every success with England."